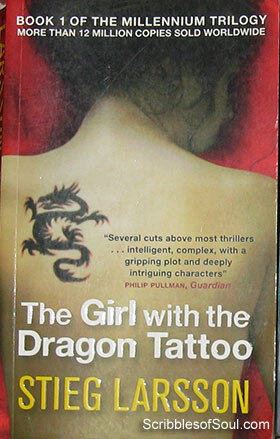 The name ‘The Girl with the Dragon Tattoo’ was intriguing enough to draw me towards this book and as I anticipated, the novel is a murder mystery written with a penchant by Late Steig Larsson, a Swedish author. The main characters of novel are Michael Blomkvist-an Investigative Journalist and Lisbeth Salander- An asocial girl working for Milton Security Services. They join forces to solve the case of Harriet Vanger of Hedestad, who got missing thirty six years ago, under suspicious circumstances. The novel begins in the most confusing manner and till I read 40-50 pages, I could not even grasp what the novel is going to be about. However, thereafter it picked up speed and I could not take my eyes off it for the next few hours. The mystery is solved in a very methodical way by Michael Blomkvist, and I really could not guess the climax till the very last few pages. The only hiccup is that the story is set in Sweden, and the tongue twisting names of places and people simply left me bewildered, but nevertheless, it increases the mystery, rather than taking away anything. However, the novel has some very disturbing, gory episodes as well. I simply wish that Larsson would have exercised some restrictions in describing the grotesque murders and strange relations. I just wanted to escape those events and carry on with the murder mystery, but the problem is that these strange events are a part of the soul of this story, and hence makes this thriller, a dark mystery, at times, even repulsive. The faint-hearted must not attempt to read this novel!